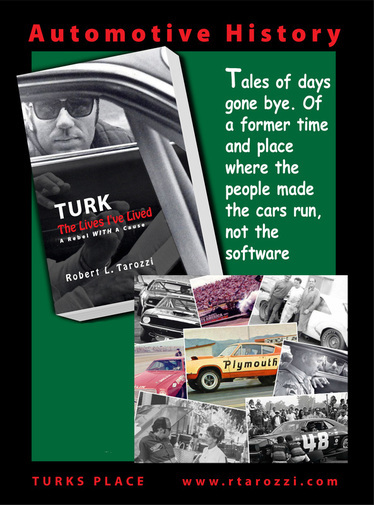 A memoir of automobile racing in the 1950s thru the 1990s. As viewed from the trenches, where the grunts live. When Performance was the Solution Not the Problem. ​Started as an avocation and then shifted to the big time. Chrysler, AMC, Hurst, Keith Black, Brad Anderson, Harley D, and a few save the world projects. NHRA, NASCAR, SCCA, Off Road, & Motorcycles. Designer, developer, driver & race engineer - and More. All in one lifetime! The accolades are over and done, it's time to get back to work. There was one Trans Am event I forgot to include in my book, "The Lives I've Lived." It recalls the Bridgehampton NY race , out in the 'Hamptons'. Im my mind it was 'Our Finest Hour'. Hit the link below and you will be transported to the Hot Rod Magazine/Mopar Muscle site. The article has been captured there for your edification and enjoyment. This is my cautionary tale that embodies Myth, Mad Schemes, Saga, Fable, Folk and Fairy Tales, and Some Truths. I invite you to come along with me to hear and sense the modern beginning of the Hot Rod underground; NASCAR and Trans Am before the rules tame the game. Before money changed the face of racing. Budgets where small but enthusiasm and talent were the predominant ingredient. The individual mattered, he really did. Believe it my friend, there was a time when individualism was a positive and meaningful pursuit. Unlike today where you must be part of a team and play by the rules, whatever that means. Thankfully I am from the former time and place. For all who missed that moment in time I will attempt to take you back where an individual was able to pursue a course to his liking, wear a multitude of hats and shift gears at a moments notice without losing momentum. The following is a quote from an unknown hero of mine. I have tried to live up to his expectations.